Part one of this post explored the issue of diversity raised by John Edwin Mason’s tweets about the results of Colin Pantall and Joerg Colberg’s initiative on what’s new in contemporary photography. It’s worth reading part one before part two to get the whole argument, but as a quick overview, part one suggested that the value of Mason’s tweets was as a reminder to the participants and anyone else in a position of distributing and promoting photography of the importance of keeping a wide-eye in terms of curation as well as an encouragement for editors to avoid the easy habit of showing what's close at hand ("local" work – both physical and online). I turned the focus of the first post towards the general lack of photography made outside the United States and Western Europe on major independent photography sites that are based in, or written by, people from those two areas as part of an explanation for why the lists made for this initiative were dominated by white photographers from those same areas. Moving the conversation ahead, Mason's tweets provide us an opportunity to investigate another theme that overlaps directly with part one of this post: problems in online image distribution. Photography sites such as those run by the people involved in this initiative (I’ll just use "sites" to stand for all blogs, pages, magazines, etc.) are almost all run by people who are also professors or photographers or do other work that actually pays. The hours they commit to this are in most cases a gift, not a job, and they are necessarily limited in the time investment they can make. Let's say one of these editors responds to and agrees with the premise of part one of this post. How are they going to source the work? While editors can be criticized to a degree for their local editing in this initiative and for general curatorial tendencies of largely using local work, there are also major problems in facilitating their - as well as anyone else's - encounters with and knowledge of international work. We all have limited time and digging through what's out there and finding sites that feature global work specifically is difficult. We frequently think about and talk about the sea of images online. Ironically in the digital era of ubiquitous images and information-sharing, there are very few sites specifically focused on showing international work. What’s the best site with navigation in English featuring Brazilian photography? Russian? How about the entire continent of Africa, much less particular to a country? Tens of thousands of photographers make professional work in areas that are represented by disparate, separate sites that generally have small profiles or else they make work in areas with no local sites at all. Work by international photographers, with the possible exception of Japan, is honestly hard to find online and even Japan, as Tokyo-based editor Dan Abbe has noted, generally does not produce externally focused online editorial projects. I’m not sure about the submissions to other sites, but the great majority of submissions to fototazo are received from North America and Western Europe, I'd guess 80%. This leaves editors with a real issue assuming an interest in broadening the work they show: with limited time and limited submissions sent to them, the current online architecture is working against their being able to find the work they would theoretically have the desire to show. To underline the lack of sites focused on showing global work, I’ll mention a series of posts that I've been working on called International Site Profiles. The idea has been to select a site that largely features work from a particular country or region outside the US and outside Western Europe, then to publish a short profile of the site (here’s an example). 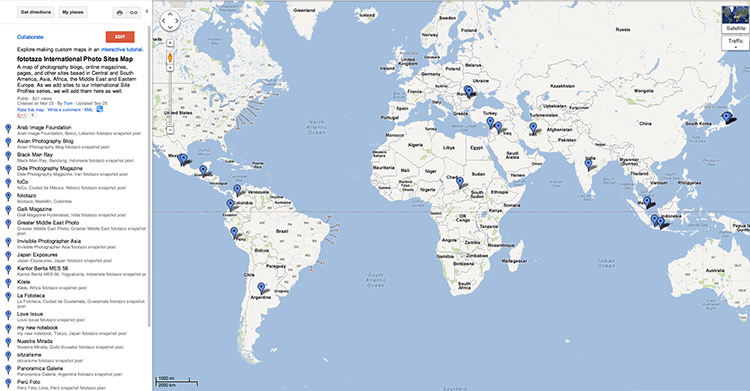 The sites are then pinned on a Google map to help readers explore them. The minimum requirements for the series are that the site must largely show photography from a specific geographic region, have tabs in English to facilitate navigation, and it must show documentary, fine art photography, or photojournalism - i.e. no commercial sites. As an editor, it has been very difficult to find sites that meet these basic criteria. There is a eye-opening lack of sites that focus on promoting work from geographically specific areas or demographically specific groups that would help to funnel the best of that work to be known by and considered by editors based in other areas of the world. Let me use Colombia as an example to illustrate the situation because I live here. First, the inability for much of the photography community here to tap into the strength and opportunity of the online image distribution network compounds many other factors that militate against their success, so distribution problems are on top of other issues. Arts education is not great here, frankly, and there are major issues with equipment cost. Many photographers with a strong skill set and portfolio are working with cameras not considered professional by international and national editors (consider a microgrant donation!). Despite these issues and others, there is great work being made in Colombia, but what is being produced is not being distributed. There are few sites in the country focused on work produced here, but they are all in Spanish, cutting out a large percentage of international readership, and they are also disconnected from one another. As for sites for an exploratory source of Colombian photography in English, there aren't any. I have shown a number of Colombian photographers on fototazo, but the curation of this site reflects my photographic interests: omnivorous. The issue is compounded by the fact that the great majority of Colombian photographers, at least those I know, do not have individual, personal sites. The reasons are many, a few guesses include language (site building programs are in English, registering a domain has until recently been difficult without English - Go Daddy, for example, just released a Spanish interface for doing so in March 2012), the lack of local precedent, the fact a site is not a necessity for local competitions and grants, and because people would rather put their resources towards equipment. Many photographers here have Flickr accounts that serve image-sharing interests and needs and meet the local standard for an online presence, but this keeps them from being taken seriously by international editors who usually demand a personal site for their work to be considered. Colberg's yearly Conscientious Portfolio Competition, for example, requires a "proper website" and specifically says no Flickr accounts or blogs, eliminating all of my students and most Colombian photographers I know. A reasonable and common request on his part, but illustrative of a real issue in participation in the online photography world for photographers in many parts of the world. There is also another issue of aesthetics involved that deserves a mention in here somewhere, although I'll just address it briefly because it could be a separate post entirely – or a book. Some work produced in Colombia may not appeal to US and Western European editors due to aesthetic differences between cultures. To take an example from elsewhere and from another medium, the movies of John Woo produced for Hong Kong have a different aesthetic – in a word, more romantic – than movies he releases in the US which generally has a lower tolerance for what might be considered sentimental. Neither side is right of course, but the difference can sometimes limit the response of one culture to the artistic work of another if people aren't interested in, ready, or able to look past those differences. 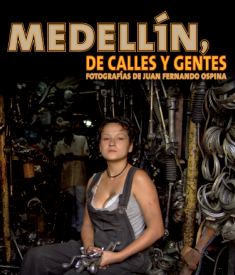 A case study for great work not being distributed beyond Colombia: my favorite photographer in Medellín is Juan Fernando Ospina. He recently had a monograph of his work published. His images frequently appear in the local Village Voice-equivalent called Universo Centro which he also created and edits. If you do an online image search, however, there are only 15 or so of his images, scattered across various sites. A number of them are editorial assignments, not his personal work. He has no site. In short, the work being produced here is very difficult to access, even if you are looking for a specific photographer. The situation in Colombia plays out in other countries. When I asked an editor from India what sites he would recommend beyond his own, he came up with two and sent both with reservations. Three sites for the second largest country in the world. China? I’ve encountered none so far for the international sites series with a minimum of navigation tabs translated to English. For all of Africa, I have found one Tumblr page that goes beyond a personal site. There are surely a number more, but the point remains: there aren’t nearly enough (please send suggestions for the series!). The last true barrier in photography is geography. I have a concrete suggestion as a first step to resolving the issue: an umbrella page or an International Photography Site Network whose project would consist of the interlinking of sites that focus on a particular country or region in order to facilitate sourcing photography from those arenas. They could also work on the identification of parts of the world not represented by a site with the goal of finding and providing support to editors that would be willing to start sites. The interlinking could be simple - a separate freestanding directional page of links or a community links page on each site, mutual promotion, and a small badge or icon on the sites showing it's connected to the network. I would suggest participating sites meet two minimum requirements - tabs translated into English to ensure international audiences can navigate the page and a minimum of 50% local or "in country" work featured on the site. Such a network should be developed by and administered by a group of editors from the global community. Let me add another hope and goal for the international photography community: the development of self-produced major sites ("major" defined as traffic volume). 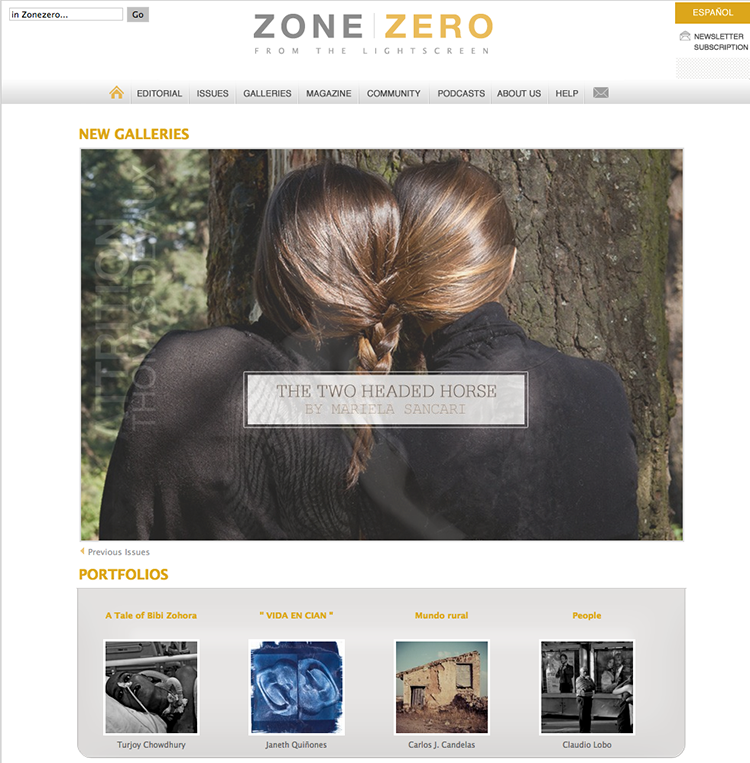 ZoneZero, Invisible Photographer Asia, and La Fototeca may be the only sites that, off the top of my head, qualify for that designation. While recognition by the photography community in the US and Europe is important for international photographers and while international work is important for the audience in the US and Europe to see, the goal shouldn’t be to create an international feeder network for US and Western Europe-based photography sites and editors, but rather to pursue both showing work on those sites as well as developing stronger international sites. Pantall and Colberg’s initiative was in a light-hearted spirit, but Mason's tweets provide a chance to reflect on serious issues. Mason is right to assert editors should be doing more homework on what’s out there, not necessarily with the goal of becoming authoritative experts in international work nor to change one’s sensibilities or site mission, but to put in the effort to consider more global work that fits those sensibilities and mission, even if – or perhaps especially because - it's currently difficult to access. If most blogs and independent magazines were started to provide a wider perspective than mainstream photography sites and to show work that the mainstream won't, then surely part of that self-applied mandate should be to include a wide geographic perspective. Furthermore, we can take advantage of freedom from advertising, market pressures, and editorial decisions made by committee to show what we think is important - and hopefully I've argued through these two posts that showing global work is important for us as editors as well as for the photographers and our audiences. This post has addressed independent sites because they were the ones included in this initiative and to whom Mason directed his tweets. The issues, problems, and responsibilities are compounded for sites and magazines at the top of the distribution pyramid. However - and maybe I’m being overly optimistic here - I believe independent sites serve as a source for the top of the pyramid and the work they choose to show does make it to important desks, adding extra currency to Mason’s comments as they apply to independent sites. Equally important to arguing editors should do their homework is to make the job of exploring global work easier for everyone by working to address the current disconnected and limited structure of the online global photography world. This should result in a corresponding diversity – and I don’t just mean in terms of race - in the online photography arena. It will facilitate the deepening of the collective voice of contemporary photography, providing a fuller landscape of images and a more balanced vision of what is happening in contemporary photography instead of a homogenized one. Projecting forward, I think that this will help to avoid past problems in photographic history by eliminating any possibility of duplicating a situation where a tight vision of a limited number of people creates a self-fulfilling narrative of what new ideas in photography are by only considering largely what they know and who they know from limited, local sourcing. Creating a full, rich, representative idea of what contemporary photography is, and of what the photographic history of the 2010's will be, begins at the sources of entry into the contemporary landscape – such as independent photography sites.